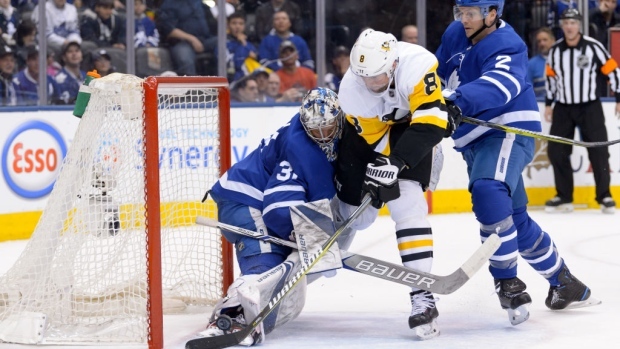 BOCA RATON, Fla. — Change is coming to the coach’s challenge for goaltender interference, Toronto Maple Leafs general manager Lou Lamoriello said Monday. The NHL’s 31 GMs will take the next two days to sort out exactly what that change will be after goaltender interference dominated first day of their annual meetings here. Goaltender interference was scheduled for 90 minutes on Monday’s agenda, but the three-hour debate went on so long it was the only topic of conversation at the meeting. NHL senior vice-president of hockey operations Colin Campbell, along with colleague Kris King and director of officiating Stephen Walkom, led the media through a series of some of the most controversial calls on Monday afternoon. The NHL reported that out of the 1,114 games and 6,593 goals scored this season, there have been just 170 video reviews for goaltender interference, including those triggered by the Situation Room in the final minute of games or overtime. Of those 170 reviews, Campbell said Monday that there was internal disagreement or disagreement with referees on just nine scoring plays. “The percentage of that is minuscule,” Campbell said. The issue is not in the number of internal disagreements, but rather that in the 170 video reviews, coaches, managers and players say they have no idea what to reasonably expect as a given outcome. Many have likened it to a coin flip. One of the 14 clips the NHL showed GMs on Monday was when Golden Knights forward James Neal broke his stick over the mask of Jets goaltender Connor Hellebuyck on Feb. 1 while his teammate was allowed to whack in a rebound. The NHL said the GMs were split on that debate, with some saying it should have been goaltender interference because of the slash and others saying the puck was already loose behind Hellebuyck before that. - No material change, but a clarification as to what exactly constitutes incidental contact in the crease. GMs were presented with the exact, detailed wording of the rule from the rulebook, and there was support for making it clearer to officials as to how they would like to see it interpreted. One idea was to better explain to the fans how each call is reached. The NHL began sending an explanatory message with video to all managers and coaches the day after a challenge after the All-Star break. - Install a dedicated referee presence inside the Situation Room to help steer the conversation for sake of consistency. Campbell seemed to pour cold water on that because there is such little time left in the season, plus the number of referees involved in decision making drops from 34 in the regular season to 20 in the first round, 12 in the second round, eight in the conference final and four in the Stanley Cup final. - Take the final decision away from referees and place it solely in the hands of the four or five members of the Hockey Operations department in the Situation Room. This could spark a turf war, since Walkom confirmed that the NHL Officials Association does have language in its bargaining agreement that ensures their right to make the final call on the ice in the case of video review. - Remove the coach’s challenge in its entirely, taking control away from coaches and referees, and have the Situation Room judge every goal for potential infractions. A drastic rule change like that almost certainly would not come midseason, but instead happen in the off-season. Some believe it’s impossible to put the genie back in the bottle now with video review, but others say it is the only way to truly silence the lightning rod that goaltender interference has become. The belief is the first three of those four potential changes, since they procedural in nature, would likely not require NHL Players' Association approval to be enacted. Campbell said deputy commissioner Bill Daly will weigh in on that approval process once GMs make a decision this week. “The hope is by Wednesday we can tell you some direction we're going to take on this process and what will change,” Campbell said. For now, the NHL’s GMs will sleep on it.